Account for personal use. No connection with any company. Right account if all you need is to leave a testimonial for someone. Use this account if you want to make a business, property or product prominent in the online world and not the staff associated with it. Account for businesses with one or more staff. The testimonials collected will be for individual staff members and displayed cumulatively for the business. account would be put on hold till a resolution is made. 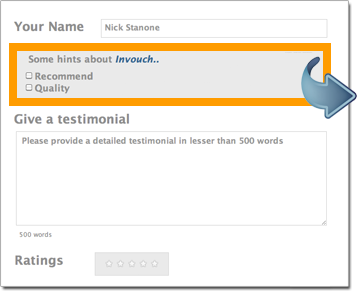 This is how the testimonial entry screen will look like for the people whom you invite. Marked area is the hint text. When user checks each box, the text that you have entered against each hint text code will be populated on the testimonial entry area.